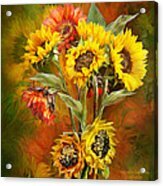 Queen duvet cover (88" x 88") featuring the image "Sunflowers In Sunflower Vase - Square" by Carol Cavalaris. Our soft microfiber duvet covers are hand sewn and include a hidden zipper for easy washing and assembly. Your selected image is printed on the top surface with a soft white surface underneath. All duvet covers are machine washable with cold water and a mild detergent. Thanks so much for your comment and like, Jeff. Thank you very much, Sorin. Wow, such an amazing piece! So beautiful !! Congrats on your sale. 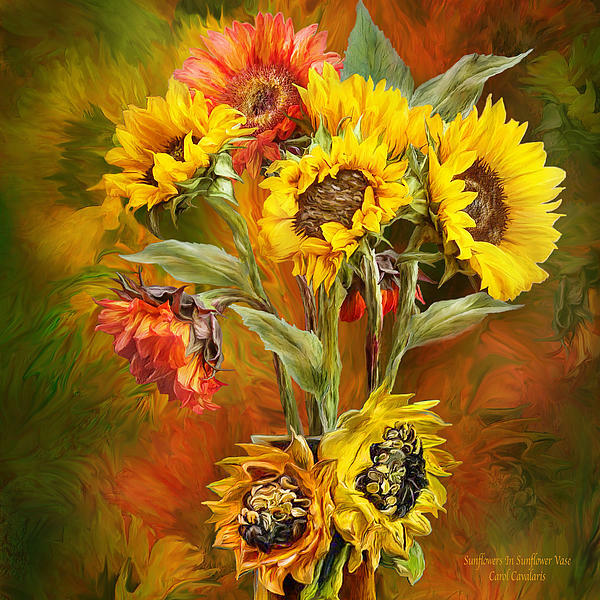 So glad you like this, Linda, and thanks for the fav and like. Thanks so much for your lovely comment, like and vote, Jeannie. Appreciate your lovely comment, Maria, as well as your fav and like. So glad you like this, Joann. Thanks for your comment, fav and vote, Teresa. . . ★ . . congratulations on your sale Carol . . ★ . . Thanks for your lovely comment, vote and fav, Anand. Congratulations on your sale Carol! 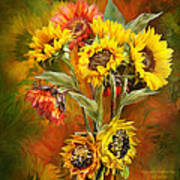 Big bold sunflowers Bright happy faces Like capturing The last blooms Of Autumn sunshine Inside a sunflower vase. 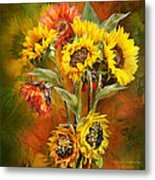 Sunflowers In Sunflower Vase prose by Carol Cavalaris This artwork of giant yellow and orange sunflowers inside of a sunflower vase is from the Flowers In Fancy Vases Collection by Carol Cavalaris. This art is also available in a long rectangular version.